Fluted Demilune. Custom furniture. Hand carved furniture. High end furniture. The Fluted Demilune Cabinet’s design was inspired by ancient Greek and Roman fluted columns. The Greeks probably started carving flutes in their columns because their earliest columns were made out of wooden tree trunks, and when the builders shaved the bark off the trunks it left these vertical gouges. When they began to build stone temples, they copied the gouges from the wood because it made the columns look skinnier and taller and more elegant. Fluting the columns, one flute after another, also gave the columns and the whole building a feeling of rhythm, which architects working in ancient Greece thought was an important aspect of a temple. This half-round cabinet has a hand-carved anthemion frieze. It is thought that the anthemion originated in ancient Egypt and has influenced Greek art. Egyptian palmettes or Greek anthemions were originally based on features of various flowers, including the papyrus and the lotus. This neoclassical cabinet is available in multiple sizes. It has one fixed shelf and one Melamine-lined drawer. This exquisitely detailed cabinet is offered in a variety of finishes and accents. Door pulls and drawer pulls are hand-forged solid bronze. 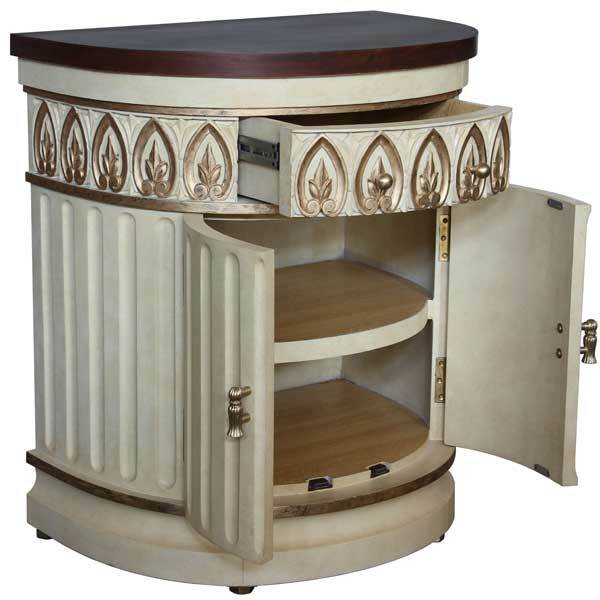 The Fluted Demilune Cabinet was designed by Shah Gilani, ISFD. Custom sizing is available.